Termites are one of Mother Nature’s tree recyclers and as we all know the temperate rainforest habitat we live in is a perfect place for termites to be making their living. Termites use a technique called “thermo-shadowing” in order to decide where they will come to the surface to forage for food. When a tree falls to the ground it begins to trap moisture under it creating rot and a temperature gradient the termites are able to sense as a food source. House foundations also mimic this natural thermal gradient and encourage the termites to the surface. They may appear within structures through cracks in the foundation; any wood that may be in contact with the earth; or build protective mud tubes to move from the ground to the wood portion of the structure. Subterranean termites are ground-inhabiting, social insects that live in colonies and feed on cellulose or wood. They travel through distinctive mud tubes to reach food sources above the soil surface, unseen by predators. Any damage to these tubes is quickly repaired. Full-grown workers are soft-bodied, wingless and creamy white; about 1cm in length. Once or possibly twice a year, usually in the fall, new colonies are formed when winged reproductive emerge in flight or swarm. Flying ants and swarming termites are often difficult to tell apart. After a flight though, termites shed their wings and return to the ground; flying ants will drop to the ground and die without shedding. Termite swarmers appear to have only two body parts, relatively straight antennae and two pair of wings that are longer than the body. 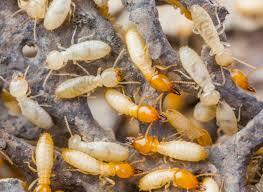 A termite swarm usually only lasts an hour or two but they are often the signal there could a hidden problem close by. A trained individual should be called in order to look for other possible signs of termite evidence which may affect your home. Pest Doctor in Nanaimo is pleased to have an opportunity to bring to you a termite monitor that closely imitates the thermal shadow termites are searching for. In areas where termites have previously been detected, the monitor can be used to identify any part of the colony that may not have been affected by the treatment or any additional colonies that may be in the vicinity. The monitors contain a cellulose matrix which closely mimics the conditions of decaying trees and allows the termites a comfortable place to sub-colonize. Once detected the bait matrix can be switched to bait that is formulated to be consumed by the members of the colony. 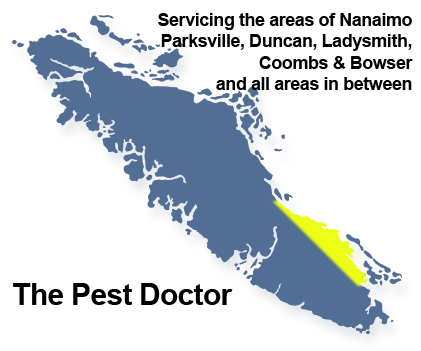 Please call the Pest Doctor office in Nanaimo for more information.